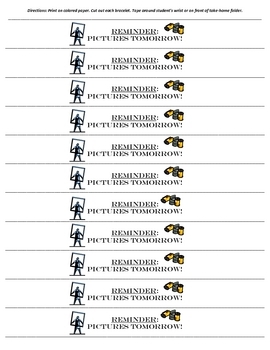 Quickly and easily reminds students/parents about upcoming important events! Save your valuable time and keep these handy on your computer! 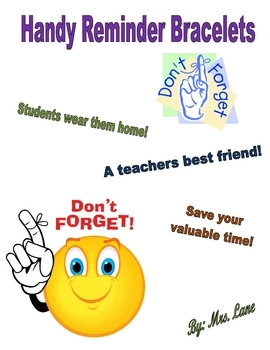 Just print, cut out and tape on students wrist. 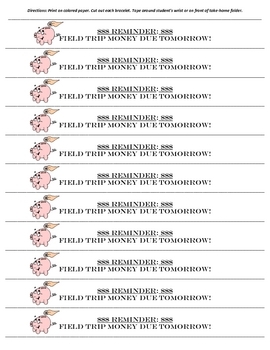 *return permission slip tommorow, pictures tommorow, field trip money due tommorow, field trip tommorow, bring bag lunch tommorow, test tommorow, standardized test tommorow, science test tommorow, social studies test tommorow, math test tommorow, reading test tommorow, spelling test tommorow, vocabulary test tommorow, book report due tommorow, project due tommorow, no school tommorow, early release tommorow, half-day tommorow, library books due tommorow, bring lunch money tommorow, my bus/car number is __, and a blank template for you to personalize!